Doctors aren’t perfect. They make mistakes. Some mistakes will have zero impact on your health and on your personal injury case. Some mistakes or impossible to prove. But other mistakes can have a devastating impact on your health. That’s where we step in. Goldfinger Law has been helping victims of patient care and medical errors for years with their claims. Medical Malpractice cases are very difficult to prove. Only on the very rare occasion will a medical malpractice case be so clear cut that it resolves quickly and quietly. These cases are usually long, drawn out, and very complicated. The standard of care to sue a doctor or medical professional for their negligence or medical error is a higher standard than you’d normally find in any other personal injury case. It must be proven beyond a balance of probabilities that your doctor failed to meet the care of a reasonable doctor in that same situation. So long as your doctor followed procedure, protocol and acted as a reasonable doctor in that situation, proving negligence will be very difficult. Before every medical malpractice case, Goldfinger Law will retain a doctor or leading medical expert in your field of care to assess the merit of your case. This doctor will give us their opinion on whether or not your case will stand a fighting chance in Court. But these opinions are NOT free. They come at a cost. Only in the most obvious of cases will these medical opinions be free of charge. Without an expert opinion from another doctor to comment on whether or not the alleged offending doctor breached the standard of care, establishing a case for negligence against the offending doctor is very difficult. Even with a favourable opinion which establishes liability, medical malpractices cases are very difficult because there are so many factors to be considered. Causation and damages are also difficult to establish in many medical malpractice cases. 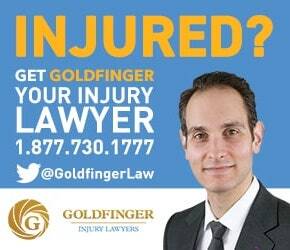 If you or a loved one has fallen victim to a doctor’s error or medical malpractice, contact Goldfinger Law for your free consultation. "I am writing this letter to try to express the feelings of gratitude and complete satisfaction that have accompanied my ongoing association with Mr. Goldfinger's handling of my case. With no fear of remorse I can recommend him, and his staff, fully and completely to anyone who should find themselves in a predicament as dire as the one they rescued me from. I cannot say enough about this fine group of professionals. Courteous to their clients, friendly with one another, yet savage to the lawyers for the "bad guy". Trust them. They really are on your side."